Segregation was an extremely damaging institution, one that continues to shape America even today. The Democratic presidential race seems to have picked the scab off of latent racism that still festers. Here is a shoe store catering to blacks in Chicago, Illinois April 1941. See more Flashback Friday photos. We were disgusted by this photograph by international artist, Vanessa Beecroft. Are we being too sensitive or does it scream exploitation to you as well? Black children are among some of the most obese children in the nation, ranking just behind Hispanic children. Researchers now believe childhood obesity is caused by aggressive marketing. See if your family has fallen into the fast-food marketing trap. 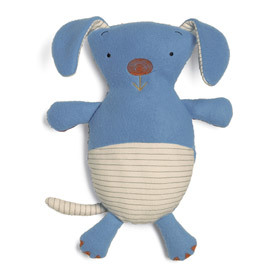 We love these plush toys for babies and toddlers and love the price even more! C-Sections are increasing among pregnant women, but they’re not always safe. Learn why. Remember this week, Hillary Clinton blasted Barack Obama for having dealings with a slum landlord, Rezko, in inner city Chicago? 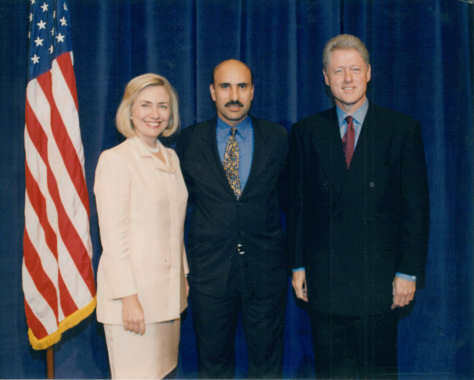 Seems like Hillary and Bill met him once themselves. Oops! Read more from Mama Noire’s mom-blog. Save an EXTRA 25% at Macy’s weekend sale. Find great products at fabulous prices. SavedbytheBud.com — If you’ve always wanted your husband or significant other to send you flowers, but you knew they had no clue where to start tell them about SavedbytheBud.com. 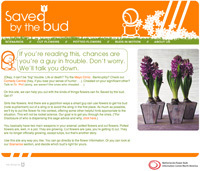 Saved by the Bud was created especially for men who are clueless about flower buying. Great site! Personalized Sharpies — Now, who wouldn’t want their very own personalized Sharpie? Choose from ten fonts, up to two lines of text, and dozens of fun and creative clip art icons and graphics. A virtual Sharpie sample also lets users “play” with their options and preview their selection before ordering. Personalized Sharpies are available in quantities of six for $11.99. Go to mysharpie.com to order. Order by February 2 to receive by February 14.